A Santa Monica Trip to Welcome the All-New Care Bears™ Coming To Boomerang! Friends, the lovable, huggable Care Bears are back and Benny, Toby and I were invited to celebrate the launch of their new adventure, a brand new 2D animated series called Care Bears: Unlock the Magic, which will debut on Boomerang on February 1.
where we had a chance to meet some really cool people including a few of the series’ creators, celebrities, some SERIOUS Care Bears’ fans and Grumpy Bear himself! There were amazing treats for all guests! The awesome babe that runs Critterosity was on hand doing Care Bears face painting. Benny decided to go for a Grumpy Bear on his cheek. Toby didn’t want any face paintings, but he —DID— want arm paintings and chose a rainbow and Grumpy Bear (one on each arm). Kids (and Parents) had plenty to snack on. For the adults, there was sparkling wine with rainbow sprinkles and a cotton candy cloud. 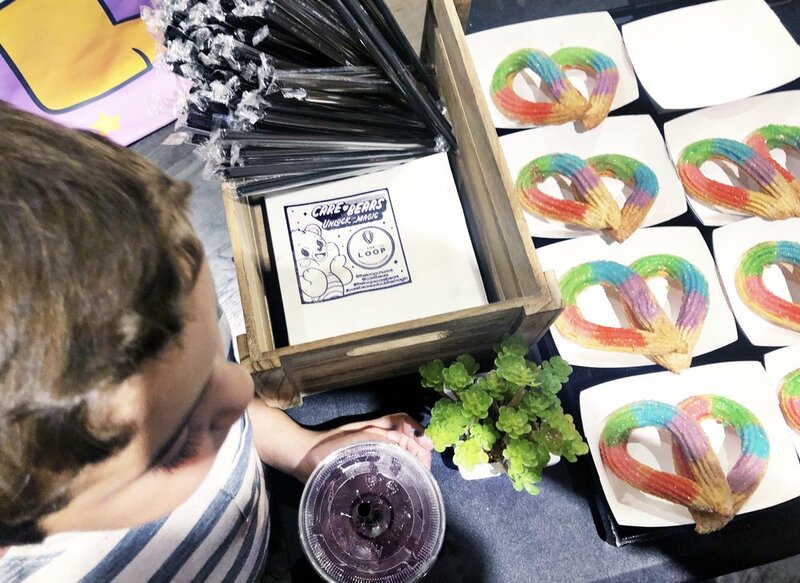 The Loop Churros provided Rainbow churros and watermelon lemonade for all guests. There was rainbow popcorn and rainbow-colored trays full of veggies. A current take on The Care Bears that also plays homage to iconic brand elements like “The Care Bear Stare” and explore never-before-seen areas surrounding Care-a-lot called “The Silver Lining.” As a result, the bears will get to meet new creatures and employ their powers and wits like never before. There will also be a new character named “Dibble”— who’s as eager as a puppy and curious as a kitten. After the Care Bears discover Dibble, she becomes the team’s pet and newest companion. She communicates through limited words, coos and sounds. It’s sometimes difficult for the team to understand what she is saying but it’s always clear what she’s feeling. She gets around by bouncing, hopping and her own tiny cloud! It was a fun time where many sweet memories were made! We can’t wait to catch Care Bears: Unlock the Magic on Boomerang! A New Hot Wheels Exhibit at the Discovery Cube L.A.